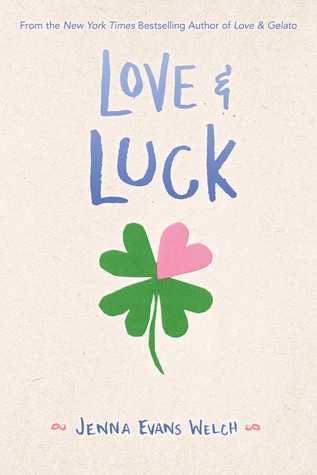 Today, I am lucky enough to have Jenna Evans Welch, author of Love & Gelato, on the blog as part of the blog tour of her latest release, Love & Luck! If you have ever been curious about the life of an author, you’re in luck because Jenna is sharing a peak of what her day-to-day life looks like! Wake up. This is almost never pleasant. I am not a morning person, and it doesn’t matter how much sleep I’ve gotten, it’s never enough. I rarely wake up to an alarm clock, usually it’s my son doing a karate jump onto me while simultaneously growing four extra elbows that are magnetically drawn to my ribs. Good morning! cky tables, friendly staff, and really great pound cake. I drink coffee, daydream about faraway places, and have a few hours to hang out with whatever project I’m working on. This part of my day never lasts long enough. Evenings are more chaos. Baths, dinner (about fifty percent of the time this involves spaghetti, because if you haven’t seen a baby enthusiastically eat spaghetti you haven’t lived), more chasing of the dog, playtime, and in the summer usually some time in our hammock—we have a pretty dreamy set up between two leafy trees. Both kids are read a mountain of books and then put to bed. At this point I always swear I’ll get to work on something adult (dishes, bills, etc.) but I almost always end up falling down on some soft surface and reading instead. Around 10 PM I get a strong urge to bake something excessively messy and involving large amounts of butter, and I either give in or go to bed. The morning begins with more small elbows…rinse and repeat! For me, the key to writing while also being a mother (and this would apply to being a student, having a day job, etc.) is to compartmentalize. Writing time is writing time—I do my best to not think about the rest of my life during my few hours I have. And when I’m home I try to focus on what I’m doing there rather than wishing I was in my book (this doesn’t always work, once ideas start they rarely want to wait). I’m not always great at it, but being present is key—the more you can commit to whatever part of your life you’re currently living, the better you’ll be at whatever it is you’re doing. Thanks so much for this opportunity! I hope you all enjoy LOVE & LUCK. I agree! I can’t wait to read it. Have you read the author’s other novel, Love & Gelato? This is such a wonderful and insightful post! Thanks for sharing! Right!? It’s so interesting seeing a peak into a writer’s life! Makes me even more excited to read the book!